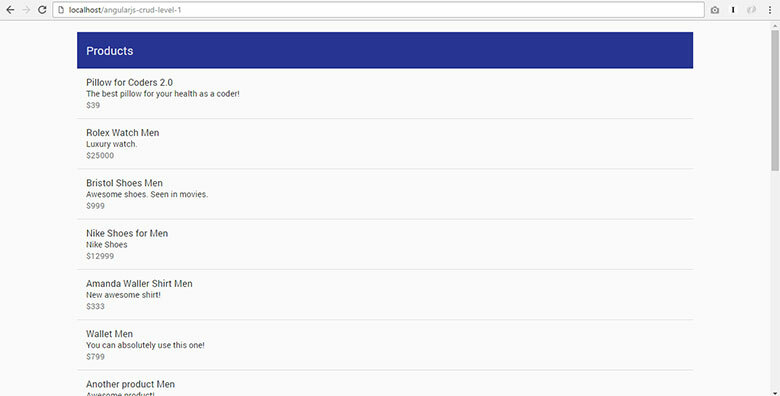 AngularJS CRUD Example with Material Design – Step by Step Guide! Previously, we learned how to create, read, update and delete database records with our React CRUD Tutorial. Today, we will learn how to do the same CRUD operations with AngularJS, Angular Material and REST API. 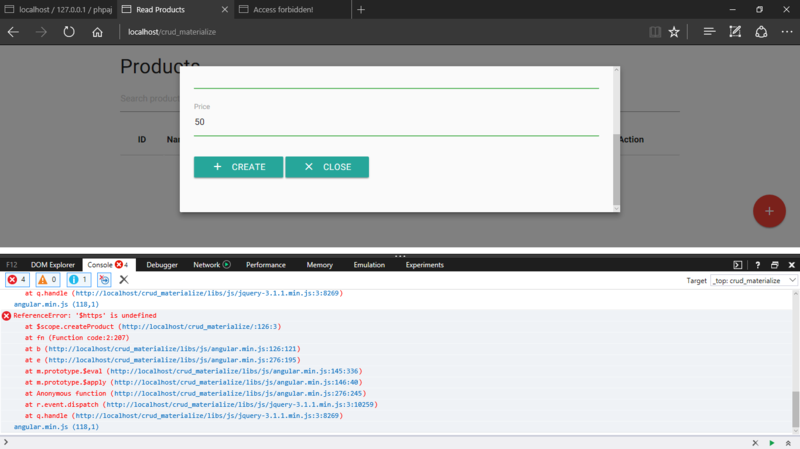 5.0 How To Read JSON Data Using AngularJS? 6.0 How To Create or 6Insert Data Using AngularJS? 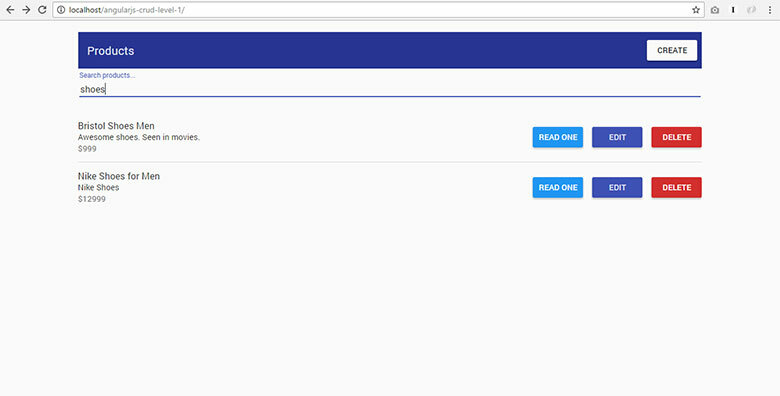 7.0 How To Read One Data Using AngularJS? 8.0 How To Update Data Using AngularJS? 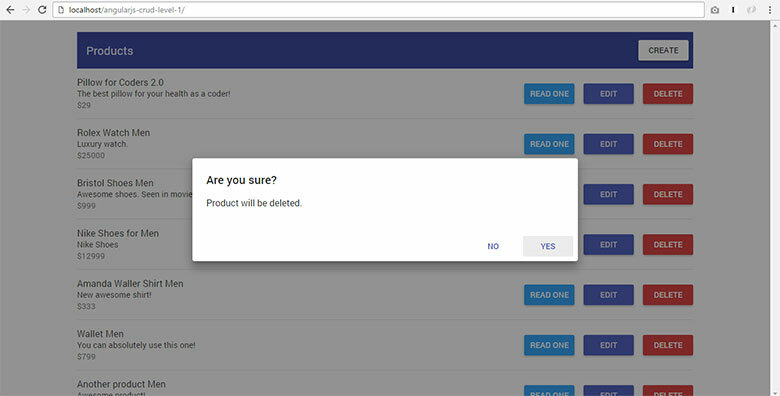 9.0 How To Delete Data Using AngularJS? 10.0 How To Search Data Using AngularJS? 11.0 How To Run The Source Code? Before we start, we want to let you know that your feedback is important to us! If there's a section in this tutorial that is confusing or hard to understand, we consider it as a problem. Please let us know. We will solve this problem within 24 hours. Send a detailed description of the problem to my email to MIKE@CODEOFANINJA.COM today. Use "codeofaninja.com improvement" as the subject of your email. Thank you! It makes the development faster because we can implement useful concepts like dependency injection, two-way data binding, reusable code and unit testing. This tutorial will focus on creating, reading, updating, deleting and searching database records. 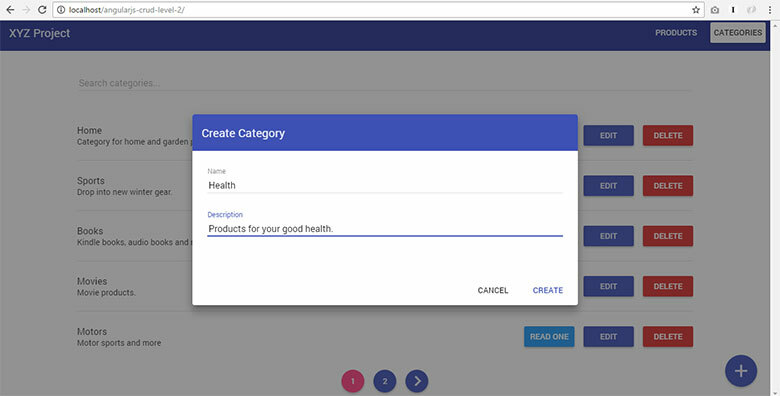 We will do it using AngularJS and Angular Material as it's user interface component. JSON data will be handled by the REST API built using PHP. The LEVEL 2 source code output proves that you can add and customize more features. It’s easier and faster if you will learn by following our tutorial below. Downloading our source codes is your huge advantage as well. 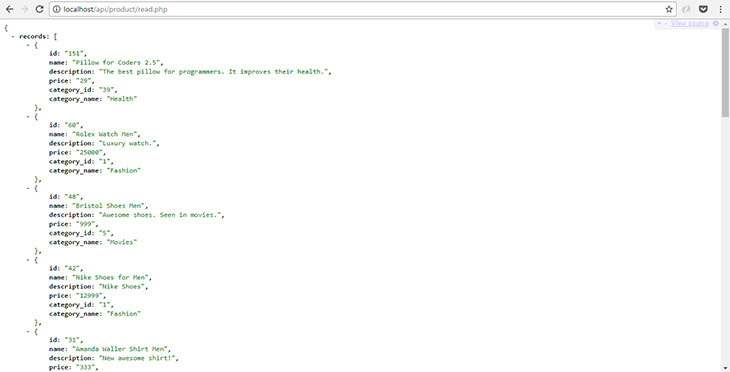 For now, let’s proceed to the step by step tutorial of our LEVEL 1 source code. Enjoy! In this tutorial, we are going to use a REST API built with PHP. We did not include REST API source code because we want you to focus on learning how to code with AngularJS, not PHP. But the good news is, we made a separate tutorial about how to build a simple REST API with PHP. Click here to learn the step-by-step PHP REST API tutorial. I highly recommend learning our REST API tutorial first. This is because we are going to use that API for the rest of this tutorial. But if you already have your own REST API that will work with this tutorial, that’s okay as well. That link will show me the list of products from the database, in JSON format. It looks like the following screenshot. The data above will be consumed by our AngularJS app. 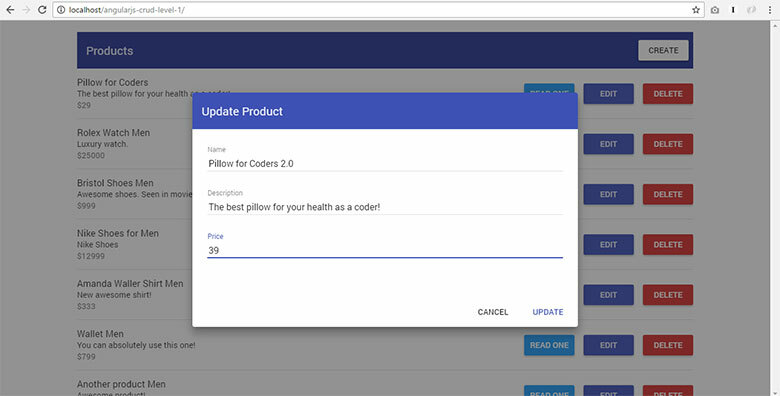 The list of products will be displayed in the page with buttons like "Read One", "Update" and "Delete". You will see it in the "How To Read JSON Data Using AngularJS?" section of this tutorial. By the way, I'm using a Chrome extension called JSONView to make the JSON data readable in the browser. At the end of this tutorial, we will have the following file structure. Create index.html file. Open that file and put the following basic HTML code. We are going to use CSS files from Google CDN. Place the following code inside "head" tag, under "title" tag of the previous section. Our "custom.css" file does not exist yet so we have to create it. We will put some CSS as well to style some parts of our application. Inside "app" folder, create "assets" folder. Inside "assets" folder, create "css" folder. Inside "css" folder, create "custom.css" file. Open "custom.css" file and place the following code. Please make sure you are using the AngularJS version we are using above. This tutorial might not work with the latest version of AngularJS. 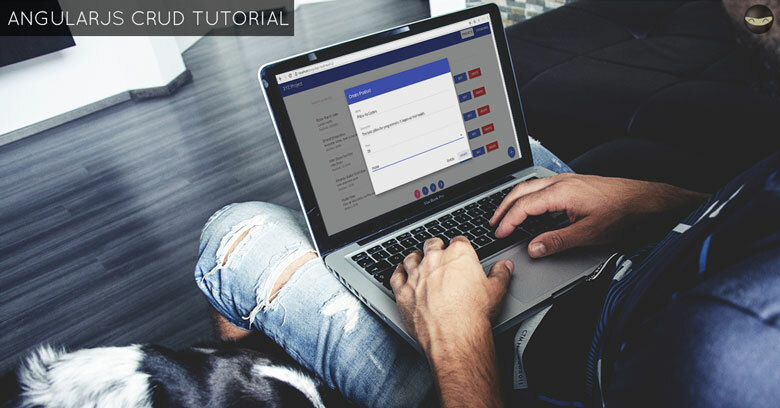 The purpose of this tutorial is to help you learn the basic concepts of AngularJS and how to use it in a simple application. This tutorial is good for you in that case. This tutorial is NOT for you if you need to work with the latest version of AngularJS and use it in a production environment. Place the following code after the previous section's code. Inside "app" folder, create "app.js" file. Inside "app" folder again, create "products" folder. Inside "products" folder, create "products.controller.js" and "products.factory.js" files. Open "app.js" file and place the following code. 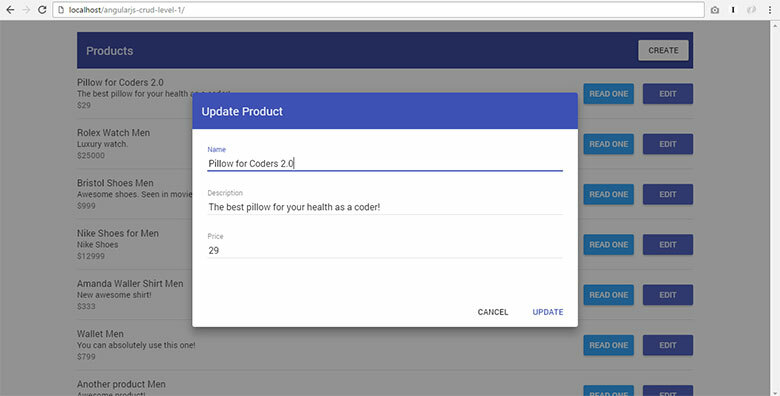 We added 'ngMaterial' parameter to enable our Angular Material user interface. 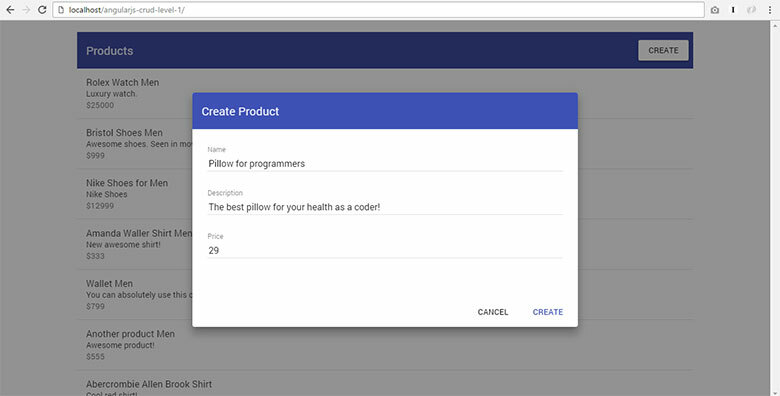 We will explain and place AngularJS codes inside "products.controller.js" and "products.factor.js" files as we progress in this tutorial. 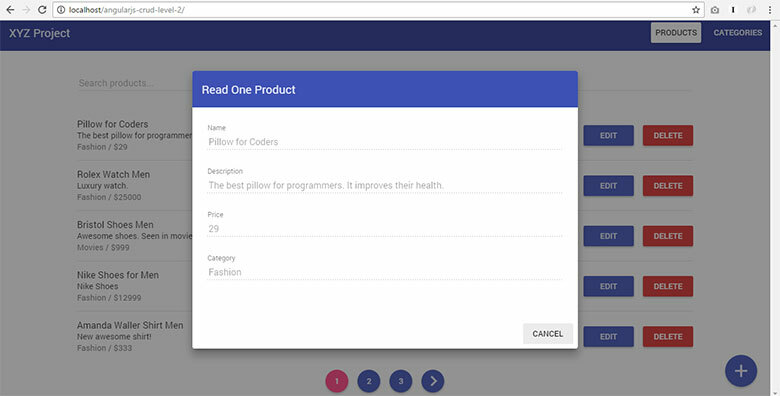 The "read_products.template.html" will hold the template for displaying list of products. in index.html and replace it with the following code. The "read_products.template.html" file does not exist yet so we will create it. Inside "app" folder, open "products" folder. Inside "products" folder, create "read_products.template.html" file. After doing all the steps above. The output is a blank page. Yes, a blank page for now. But for sure, we will see something here after you complete the next section. Open "read_products.template.html" file and place the following code. 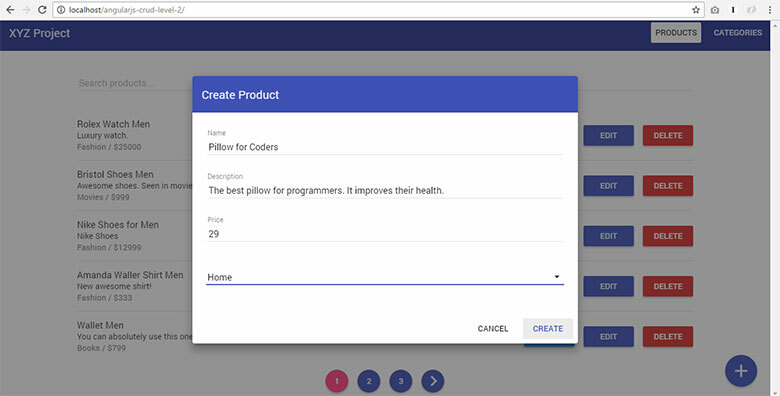 Inside "products" folder, create "products.controller.js" file. Open "products.controller.js" file and place the following code. Why do we use "factory" in AngularJS? We use it to make the code reusable. Methods in factories can be used in different controllers or parts of your application. If there will be a need for change, you don't have to go and change several parts of the application that uses the same code. Create "products.factory.js" file and place the following code. You should see the list of products. Each row should have product name, description and price. 6.0 How To Create or Insert Data Using AngularJS? We need this button to show a form where user can enter new product information. Replace it with the following code. Find "// showCreateProductForm will be here" and replace it with the following code. fullscreen: true // Only for -xs, -sm breakpoints. We are using Angular Material's dialog box above. Users may click the 'Cancel' button. We need a method for that. Find "// DialogController will be here" and replace it with the following code. Our dialog box loads an HTML temlate via "templateUrl" property. Inside "products" folder, create "create_product.template.html" file. Open "create_product.template.html" file and place the following code. Find "// createProduct will be here" and replace it with the following code. We need clearProductForm to clear form values. We are using "toasts" to show messages to users. You should see a "create" button on the upper right corner of the page. Once this button is clicked, a dialog box with a "create product" form should appear. and replace it with the following code. If the user click "read one" button, a dialog box will appear with the product information. Find "// readOneProduct will be here" and replace it with the following code. The dialog box need an HTML template with product information. Inside "products" folder, create "read_one_product.template.html" file and place the following code. We will get the product information from the API. You should see a "read one" button in the product list. 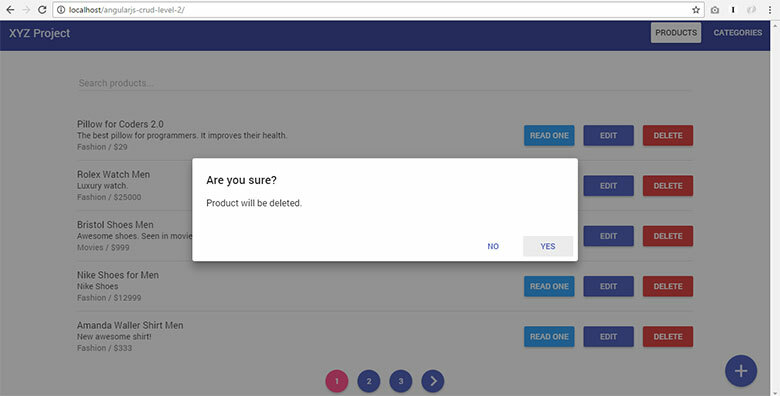 Once user clicks this, a dialog box will appear with a product information. Find "// showUpdateProductForm will be here" and replace it with the following code. Inside "products" folder, create "update_product.template.html" file and place the following code. If the user click the "update" button in the dialog box, we will send the udpated data to the API. Find "// updateProduct will be here" and replace it with the following code. The factory will help us send data to API. You should see the "Edit" button in the products list. When this button is clicked, a dialog box with "udpate product" form will appear. The form contains the editable product information. Find "// confirmDeleteProduct will be here" and replace it with the following code. 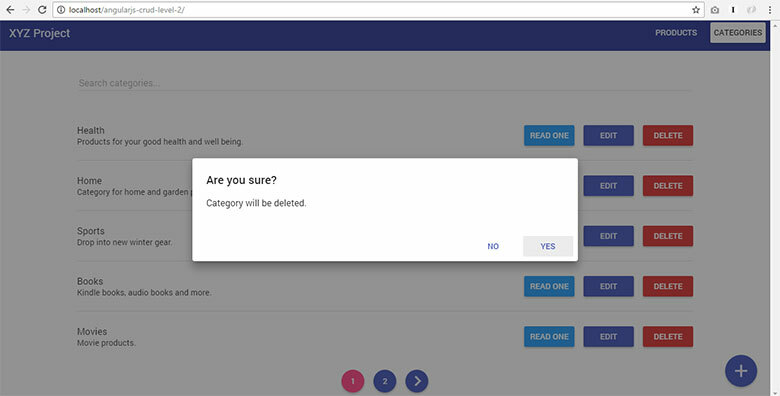 If the user click the 'Yes' button, our app will delete the record. Find "// deleteProduct will be here" and replace it with the following code. You should see the "Delete" button in products list. When a user click this button, a dialog box will appear asking the confirmation to delete the record. This feature is part of LEVEL 2 source code. We did not use "filter" to search product records. We search the records with the help of API. Find "// searchProducts will be here" and replace it with the following code. The factory will help us read records based on search keywords. You should see the "search" bar above products list. Once user type a keyword and press the "enter" key, search results must be seen. We highly recommend for you to follow and study our well-detailed, step-by-step tutorial above first. Nothing beats experience when it comes to learning. But we believe you will learn faster if you'll see the final source code as well. We consider it as your additional guide. Imagine the value or skill upgrade it can bring you. The additional income you can get from your work, projects or business. The precious time you save. Isn't that what you want? By now, you need to download our source codes. To do it, use any download buttons in the next few sections below. Once you downloaded the source codes, here's how you can run it. Extract the files to your server directory. Set up the "api" by following the README.txt inside the "api" folder. If you can see the list of products, it means your set up is correct. This means you will download the LEVEL 1, and 2 source codes in separate packages. Select "ALL LEVELS" and then click the “Download Now” button. Do you need more reasons to download it? If you found a problem with this code, we can solve it faster via Email or FB message, please send me a message via email mike@codeofaninja.com, or via our official Facebook page! Please be more detailed about your issue. Best if you can provide an error message and your test or page URL. Thanks! Please feel free to comment if you have any questions, suggestions, found something wrong or want to contribute to this code. #2 Become a true Ninja! We constantly add new tutorials and improve our existing tutorials and source codes. Be one of the first to know an update by subscribing to our FREE newsletter. Get a FREE EBOOK as well. CLICK HERE TO SUBSCRIBE FOR FREE! Thanks for reading our AngularJS CRUD Example with Material Design - Step by Step Guide! 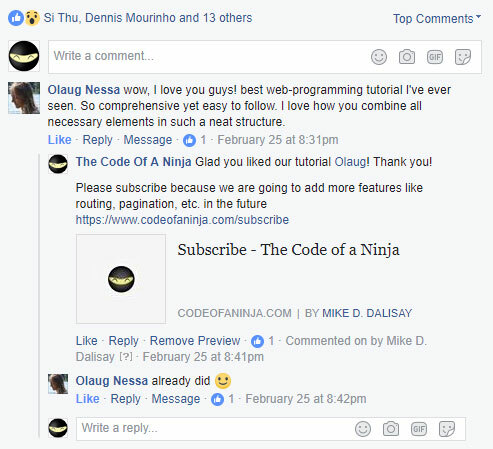 https://www.codeofaninja.com/wp-content/uploads/2015/12/angularjs-crud-tutorial-step-by-step-guide-php.jpg 408 780 Mike Dalisay https://www.codeofaninja.com/wp-content/uploads/2019/03/codeofaninja-with-text-3-1030x206.png Mike Dalisay2015-12-05 14:36:392018-05-28 07:55:57AngularJS CRUD Example with Material Design - Step by Step Guide! 1. What part of the tutorial the code is broken? 2. What are those old form of callbacks and unnecessary variables? I just want to emphasize that this tutorial is for beginners so we made it super simple and easy to understand. I’d love to hear more of your thoughts so we can correct anything that is wrong. Thanks for helping us improve this tutorial! yes i also find this code broken ? Hello @darrendupreez:disqus, thanks for your interest in this code. About your issue, we are unable to replicate it. Which part of the code did you see it and what is your PHP version? Would you provide a screenshot of the error you are facing? Based from our FB conversation: It looks like you are using a GET request. You should follow what is in the tutorial so you won’t have a problem. Please make sure that your PHP version is PHP 5.4+ and your JSON extension is enabled. Q: Is this worth getting? A: It will really depend on you. If you need to use this kind of source code example for your project, it will be a very good place to start with. The code is well tested and working here at my end (see output screenshot slideshow above as well). Several people already bought this source code without having any issues. I’m ready to help you if you found one that you cannot solve, I reply usually within 12-24 hours. Q: Why can’t it be partially free so we can determine if the code is good? A: The source code is partially free through the tutorial. If you can follow the step by step tutorial, you will get the LEVEL 1 source code for free. We encourage people to follow the tutorial so that they can experience how the source code is done and so they will learn more and won’t take it for granted. Q: The comments aren’t good? A: You cannot say that the comments aren’t good because I answered all their comments with proof and I asked for more details. If they don’t answer my questions about why and how they get an issue, it means their issue is invalid. Reasons can be they don’t follow the tutorial up to the end, they are not yet capable to understand this kind of tutorial, or they don’t ask the right questions. No worries, yeah you always seem amicable and fair. I’ll give it a shot! i follow this tutorial but i got error message and nothing to display..
can you share the working demo link? Hello @SurendarRaman:disqus, yes, send me an email mike@codeofaninja.com and I’ll reply with the demo link. Hello dude can u share m the working demo link ? You’re welcome @dh@dhagejayesh:disqus, you can watch the video demo on section 1.3 above as well. thank u so much . Hi Mike, Can You send me the demo link ? We can, please send me an email mike@codeofaninja.com, thanks! Hello @gautam, we are unable to replicate your issue, would you send us your test URL? what is wrong with this part of code? Hello @forex_maniac:disqus, please make sure you put the correct code in the product object file, please see section 8.4 above. Thanks for sharing your tip @disqus_x1t4HW4gba:disqus, I updated section 8.4 of the blog. You are very welcome @disqus_x1t4HW4gba:disqus! Hi, I have a problem with this code in step 7.8 when I click on the button the interface of Create New Product does not show. Hello @hamza, please initialize your modal using the jQuery script found on section 7.7 above. You’re welcome! About your second concern, please try to right click your browser > inspect element > console and tell me what error message do you see. Thank! Thank you for sharing this Great Piece of code. Works like a charm. Cheers! Can the table be improved by sort by alphabetical/numerical order? by clicking on the table header rows? Hello @lulberla:disqus, those features are included in the LEVEL 2 and LEVEL 3 source code. I’m considering buying level2 and level3 so that i could learn how to do angular CRUD for my own learning project. however if there is a tutorial for these 2 levels, it will be more better for me to learn. As i’m looking for more features such as sorting,option to show X amount of entries in a table and etc, could you email me so that we could discuss more about this. Hi @lulberla:disqus, thanks for your interest in our code. We admire your willingness to learn! I just sent an email to your celestale gmail account. If you did not receive it or have another email address, please send me an email mike@codeofaninja.com, thank you! Hello, thanks for the tutorial. great work. I have a problem that mine won’t edit. Its gives me the error of : unable to retrieve record. Help pls? Hello @riecengelhardt:disqus, glad you liked our tutorial! About your error, please make sure you are connected to your database. Hello Mike, Thanks for the reply. I have just bought all the levels of source code, but did not receive no download link. please send mi the link so I can download what I paid for. Hi @riecengelhardt:disqus, you sent an eCheck and your payment is pending until Jun 3, 2016. By that time, you will receive the download link. Thanks for understanding! Hallo Mike,..Today is the 5th of June and still did I not recieve the download link of the code I payed for. can you send me the link. Hello @riecengelhardt:disqus, PayPal says your eCheck is Uncleared (Expected Clearing Date: Jun 8, 2016), please check you PayPal account. Really really cool. Best tut I have ever come across. Just to add that in section 7.8 PHP code to create a new record, include_once ‘objects/product.php’; has been omitted, causing a call to undefined method error. If anyone encountered this just add include_once ‘objects/product.php’; in create_product.php. Hello @disqus_ugKnxClbec:disqus, thanks for the kind words! Thanks for the tip as well, I updated the blog post above. The following code has been added in section 7.8 above. Hi @karthik, it looks like you added a custom ‘roboto’ font, would you try to remove that first? Hi Mike, i removed it now and i have a blank page with no errors on my console… do you think there is something i should do with my backend ? It’s cool, I’ll do it. How do I make these additions? or do you make this changing? Hello @bo@boraeresici:disqus , thanks for downloading our source code! I replied to you via email. Hi @luonghuynh:disqus , it looks like your JSON has a wrong format. Make sure you script returns the correct format, try running only read_products.php in your browser. I think your suggestion makes sense @emiliano_lara:disqus, thank you! I updated section 8.3 above. @luonghuynh:disqus, let us know if this helped you. I’m sorry, was “declares the variable before if” i was doing the tutorial and I had that mistake which took me hours to find it, I’ve tried and it works. I have purchased PHP, MySQL and AngularJS CRUD LEVEL 3 Source Code. I tried to use it for my project – application for book evidence. Except I translated certain things on serbian I also changed table names and column names. After that I opened the application to see if everything is ok and saw that it couldn’t show any books from database, while categories are shown properly. Here are images to see what is the problem. I need to finish this project until tomorrow evening so I need your help because I don’t know how to solve this. I sent you the source code to your email. Thanks in advance. Hello @stefanaritonovi:disqus , thanks for purchasing the code! I did not receive any email from you, are you sure you sent it to mike@codeofaninja.com? I sent you an email (stefanaritonovic@gmail.com), let me know if your receive it. Here’s a solution we made with Turkish characters. Maybe it will work of Serbian characters as well. 1. Change database and tables charset with utf8. 3. Add charset code all PHP and HTML file. Put this inside head section of your HTML. Put this at the beginning of your PHP files. I did everything you said but still doesn’t work. I think I found a problem but I don’t know the solution. Problem occurs when I replace column price with column author. See the images below. 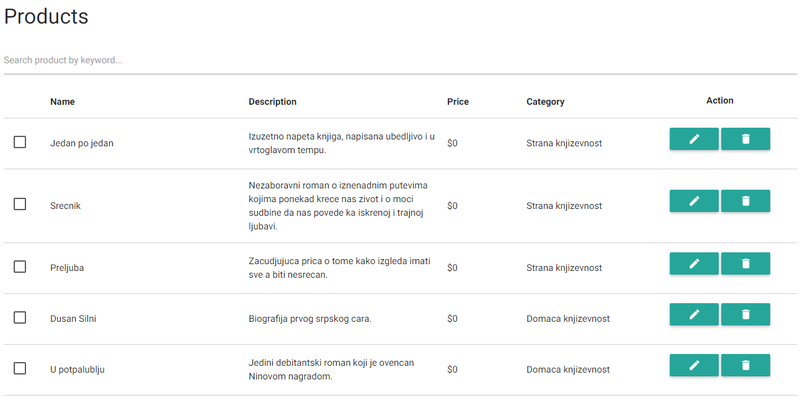 When you removed column price and added column author, what did you change in the source code? Hi @stefanaritonovi:disqus, glad it worked for you now! Who gave that points & said that comment? He maybe right but the purpose of our examples above is to give learners an example how to get started with AngularJS and not yet to be an expert of it. Also, for me it is acceptable to use only one JS file of AngularJS because the system is very small, it has only 1-2 objects. It is not a complete system with many components where you should really separate your JS files based on your objects. Hello @sowmyavejerla:disqus , we are unable to replicate your issue. It works on our end. Please make sure your $http.post function were coded correctly. Good morning. I’m at first level (7.10), but there is only one word “Products” on page and button in the right corner don’t works. Console says: TypeError: $(…).leanModal is not a function. Can anybody say whats’ wrong, please? Hello @John, we are unable to replicate your error. Would you upload your work on a web server and give us your test link so we can investigate more about it? I’ve uploaded the code here http://rana.ninja/angular/ i’m facing the same problem too . We just updated the blog post. Let me know if you run into other issues, we’ll fix it. Hello @nestoreduardoirahetamazarie:disqus , we just found out that MaterializeCSS changed the way they render modals. We’ve updated the blog post so if you’ll follow it, your code should work now. @nestoreduardoirahetamazarie:disqus I think you have $https somewhere in your code, we do not have that on our tutorial. You’re welcome and thanks for the kind words @ismaellove:disqus ! please share our site to one of your friends if you have time, thank you! Hello @Paolo, we are unable to replicate the issue. Would you send us your test link so we can help you fix it? Hi Mike, thanks for putting great content out there! Are you going to make the operations to work with Angular 2? Hi Mike, thanks for your post! I appreciate your work! I. This is in Angular 1.2.x, right? Can you show how to adapt for Angular 1.6.x (error .success is not a function, for example)? II. This pagination load the records from database on demand / per page? Or load all the records and only show per page? II. 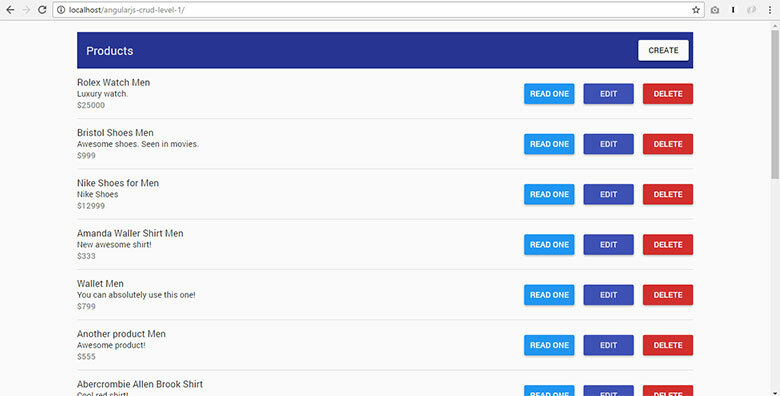 Currently, it loads all records and then do the pagination. But the next update should load the requested page only (one at a time, from the database). II. 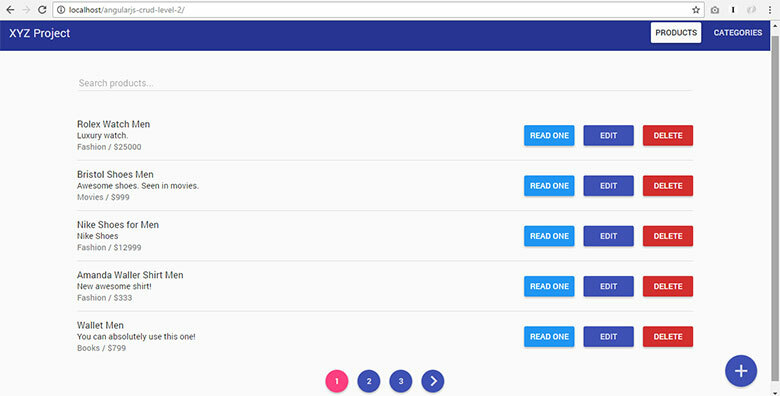 I followed this doc https://github.com/michaelbromley/angularUtils/tree/master/src/directives/pagination#working-with-asynchronous-data and created a way for pagination and search on demand from database. I can send it to you if you want. Thanks for subscribing @disqus_dZDJoWRNaA:disqus ! Thanks also for sharing your solution, I really appreciate it! Sure if you would send it to mike@codeofaninja.com. We are currently working on a tutorial for Angular2 with authentication. Maybe this can help you in the future. Sure, I’m happy to be able to help. I sent to your email. Angular2 with authentication will be very useful in the future, thanks! BTW, I chose to put the navigation buttons for pagination at the top of the table, as they disappear below the fold unpredictable depending on the amount of text in the item descriptions. Thanks for the tutorial & templates Mike! Hello @jackromanowicz:disqus , thanks for sharing your solution and kind words! We’ve update the tutorial to AngularJS v1.6.1. You’re right about the changes. Hello @baldwin. We’re unable to replicate the issue but we’ve update the tutorial to the latest version of AngularJS. Hi @baldwin, would you right click your page > click ‘inspect element’ > click ‘console’ tab. Let us know what exactly is the error message because we are unable to replicate the issue. Thank you! We updated the tutorial AngularJS v1.6.1. You may want to follow the changes above, it may solve the issues you encounter. To answer your question “Is it correct put the modal using jquery?” The MaterializeCSS library we used uses jQuery so there’s really no other way to trigger the modal. – Change, in text, the term “libs” by “assets” which is the used in the code. Hello @Rogerup:disqus , thanks for the corrections, we highly appreciate it! The post above is now updated. Hello @patrick_were:disqus , what is the AngularJS version you’re using? Hello sir! You are well hopefully, just say thank you in relation to the help you give us concerning the design of the websites. Hello @donatoh:disqus , you’re welcome! About the issues, would you right click your page > click ‘inspect element’ > click ‘console’ tab and tell us the error message that you see? @donatoh:disqus , did you finish the tutorial before running it? Hello @venkatpannala:disqus , what is the error message you see in the console? HI @omargrossi:disqus , thank you for following our tutorial. We just updated our tutorial above and now we are not using the dirPagination directive. 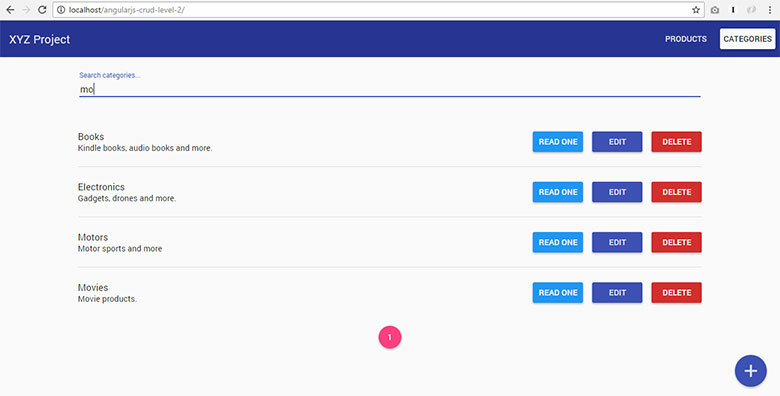 We are currently working on the asynchronous pagination feature and will post the solution soon. Hi @Jasmine, we just updated our tutorial above and now we are not using the dirPagination directive. 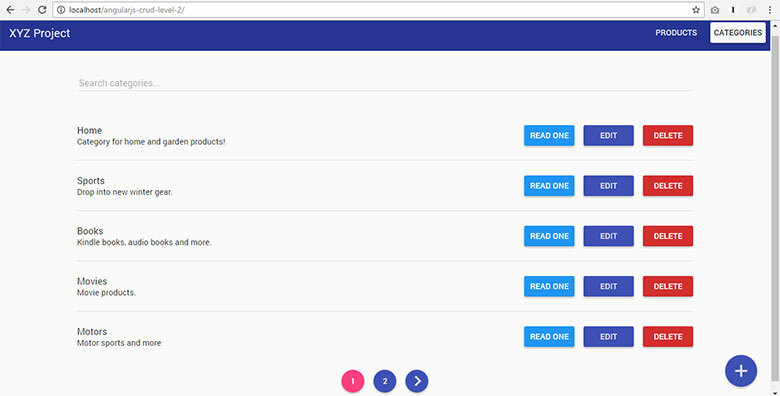 We are currently working on the asynchronous pagination feature and will post the solution soon. Hi @disqus_Bt6G8i9abj:disqus , thanks for the kind words! 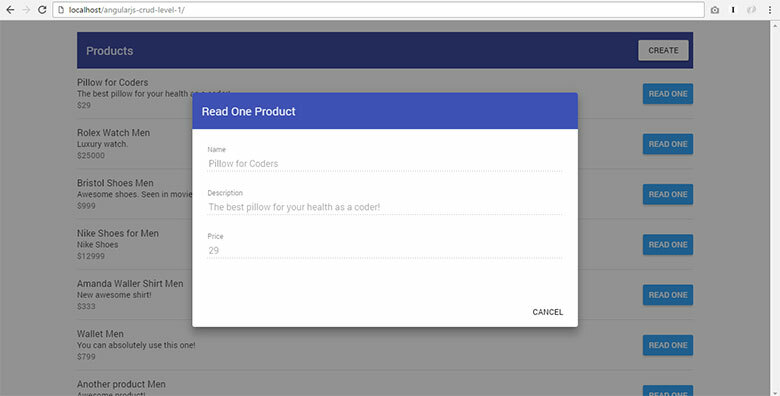 Hi @heckme, we used AngularJS v.1.6.1 and Angular Material v.1.1.0 on our tutorial above. You’re welcome and thanks for your feedback @disqus_SXJnosqiZA:disqus ! I’m getting this error after completing the readOneProduct output (7.5) only in firefox. Other browser work fine. I’ve see some things in stackoverflow but haven’t figure out how fix it, yet. Can you help, Mike? Hi @disqus_rbPHKP5LhS:disqus , it looks like you already customized the code. This is not within the scope of our support. But it looks like there’s a problem with your event handler. What are the elements you clicked or activities that lead you to this error message? oh, that was easy!! Sorry to bother! Thanks again, Mike! No worries, you’re welcome @disqus_rbPHKP5LhS:disqus ! Thanks for letting us know about the Firefox issue as well. nice tut ever about restfull api ……. Glad you liked it, thanks for the kind words @axfthalavi:disqus! Am not able to see pagination in UI.rather i get values from db properly.Am i missing something? Am calling read_paging.php file to show products . Hi @disqus_oaswx0RfBR:disqus, it is not included in the LEVEL 1 source code tutorial above. You may choose to download the LEVEL 2 source code where pagination can be found. should have the method readOneProduct. Great guide anyway, I’m working through it as a “crash course” on SPAs :p the clean code and the comments are great. Hi @patrykmihawkchoma:disqus, thanks for the catch! I updated the code above. Hello, Can you please share the read.php file? I cannot see the output since I don’t have a read.php file. Point 4.5 missing where custom.css include. Hi @Chandan, thanks for the catch. The custom.css file were used in section 4.3. Thanks for the kind words @jordi_comas:disqus! Unfortunately, we don’t have an AngularJS login tutorial. Hi @bimoan:disqus, do you mean it’s good? Thank you! @disqus_TR7OR7SoPY:disqus, would you send a screenshot of your console so we can see an error message? Also, make sure you are using the same version of libraries used in the tutorial above.